GFI Software (Formally Sunbelt Software, Inc.): VIPRE Antivirus Version 4 (Software Review) [Page: 1 of 2] - TACKtech Corp. Description: Finally Antivirus Software That Won't Slow Down Your PC! Tired of that old antivirus program that makes your PC slow down to a crawl? Interrupting what you are doing with slow scan times, causing problems and nagging you? Time for a change to next-generation antispyware that IS NOT a resource hog! No automatic credit card charge each year! * License applies per machine, no extra license needed for XP mode. Standard edition of VIPRE Antivirus includes desktop antispyware, desktop antivirus, email protection, rootkit detection & removal, and real-time Active Protection. * VIPRE Antivirus Premium is available with additional features. Installation is straight forward and easy to understand. 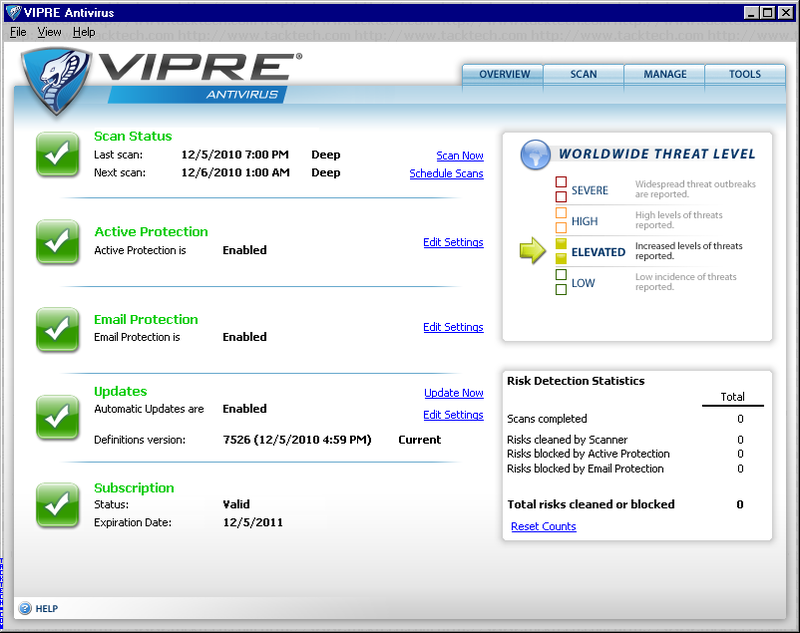 View our complete step-by-step walk-through for installing VIPRE Antivirus. The interface is clean with easy access to several setting areas and options. During our comparison of VIPRE Antivirus to AVG Anti-Virus and Microsoft Security Essentials, VIPRE Antivirus used the least amount of memory while the system was idle and during virus scanning. VIPRE Antivirus completed its deep scan four minute and twenty three seconds faster than Microsoft Security Essentials, coming in second to AVG's time of ten minutes forty one seconds. We performed and complete registry and file system scan after uninstalling VIPRE Antivirus. Unlike many Anti-Virus solutions, no remnants were found. - Includes both Anti-Virus and Anti-Spyware protection. - Firewall not included in standard version. View Page 2 for details regarding system resource usage and comparisons with those of AVG Anti-Virus Free Edition and Microsoft Security Essentials.